Bottoms up......raise a glass and toast your beloved team with this fantastic Premier League football team pint glass. 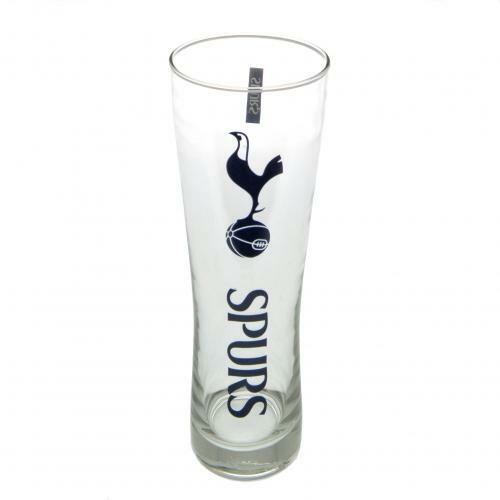 Tall and slim Tottenham Hotspur pint glass featuring the iconic club crest. A must for any Spurs fan. * Pint glass with club crest. * Holds one pint of liquid. * Approx 24 cm tall. * Official licensed Spurs merchandise. All of our products are officially licensed by Tottenham Hotspur FC which guarantees authenticity and quality and we ship everything FREE OF CHARGE within the UK so the price you see is the price you pay. Along with an easy returns process we have 100% secure payment processing with credit/ debit cards and PayPal so make sure Football Gifts Online is your number one choice when looking online for football gifts.